Let's go ahead and call it like it is: the Republicans didn't win last night - the Democrats LOST. The special election race for the Massachusetts Senate seat was Martha Coakley's to lose, and lose it she did. She didn't do her homework on Scott Brown, she didn't do her homework on the Red Sox, and most importantly, she didn't do her homework on the recent national mood that has been brewing lately. Instead, she and the Democrats rested on their laurels attained at the end of the historic 2008 election. Anybody who's even half-way been paying attention to the national mood lately could tell you that there's been a lot of tea bagger-ism and birther-ism and Cheney Terror Boogey Man-ism going on out there that has been chipping away at the Democratic agenda by planting seeds of fear and doubt into the American people. People are feeling insecure and afraid about the economy and losing their jobs right now; the Republicans demonstrated last night they they are playing right into that. Playing on the people's insecurities is what the Republican machine is good at. It's what they do, folks. How else do you think they got the most unpopular president in American history elected not only once, but twice?! That takes talent. That being said, if you're Martha Coakley and the Democrats, assuming you want to WIN, you have to (1) do your homework and (2) get passionate about the race. 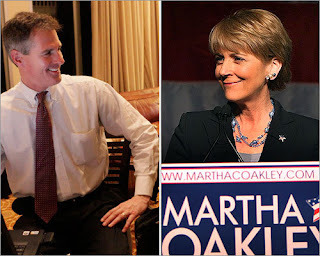 Last night's Republican victory revealed the absence of either element among the Coakley camp. In 2008, when Barack Obama carried Massachusetts 62% to 36% (1.9 million votes to McCain's 1.1 million), he knew that the Republican machine was going to play into people's fears and insecurities about the economy, or healthcare, or [insert issue here], so instead of sitting back and letting them control the message back then, he did his homework and got passionate about rolling out a message antithetical to that of his opponents: the message of hope. In 2010, however, the Democrats seem to be pulling a Corzine, whereby they sit back and assume that the tidal waves of 2008 are still going to roll them to victory. In 2008, 1.9 million people in Massachusetts voted Democratic, and 1.1 million people voted Republican. Last night, the exact same number of people who voted Republican in 2008, 1.1 million, again voted Republican, however the amount of people voting Democratic dropped from 1.9 million to 1 million. If politics has taught us nothing else it's that the candidate who assumes that they are the "candidate of inevitability" will inevitably do one thing: lose. And that's what happened last night. Sure we can talk about how the Health Care bill played a part, and how other issues played a part, but when we get down to it, it really wasn't about "the issues" and, to be honest, it really wasn't about Democrats or Republicans, it was about people who are still apprehensive about their economic future taking out their frustrations and fears on the government which, by their view, is not working fast enough to create jobs. Brown tapped into that; Coakley did not. Did Martha Coakley really trick it off? Did the people really like Scott Brown or were they just ready for something new? What will the Democrats do about Health Care now? Will the Democrats learn from this lesson for the 2010 midterm elections? Was this an indictment against Obama?